Postcolonial Asylum is concerned with asylum as a key emerging postcolonial field. Through an engagement with asylum legislation, legal theory and ethics, David Farrier argues that the exclusionary culture of host nations casts asylum seekers as contemporary incarnations of the infrahuman object of colonial sovereignty. Postcolonial Asylum includes readings of the work of asylum seeker and postcolonial authors and filmmakers, including J.M. Coetzee, Caryl Phillips, Abdulrazak Gurnah, Leila Aboulela, Stephen Frears, Pawel Pawlikowski and Michael Winterbottom. These readings are framed by the work of postcolonial theorists (Homi Bhabha, Gayatri Chakravorty Spivak, Paul Gilroy, Achille Mbembe), as well as other influential thinkers (Giorgio Agamben, Jacques Derrida, Jacques Rancière, Emmanuel Levinas, Étienne Balibar, Zygmunt Bauman), in order to institute what Spivak calls a ‘step beyond’ postcolonial studies; one that carries with it the insights and limitations of the discipline as it looks to new ways for postcolonial studies to engage with the world. Postcolonial Asylum is concerned with asylum as a key emerging postcolonial field. In much of the discourse surrounding the issue of sanctuary, asylum seekers, via their engagement with the law and the exclusionary culture of many Western nations, are cast as contemporary incarnations of the infrahuman object of colonial sovereignty. Relations between asylum seekers and host nations are framed by a relation of 'inclusive exclusion', in which asylum claimants are deprived of political and social agency but simultaneously captured by a vested interest in (re)producing them as the citizen's 'dark other'. 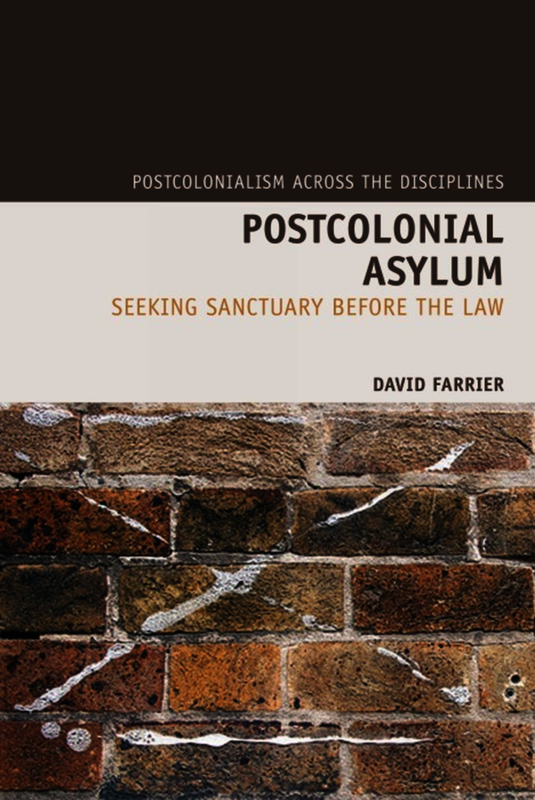 In Postcolonial Asylum, David Farrier contends that an understanding of this dynamic must be central to attempts within postcolonial studies to speak about new forms of political identity and belonging. The range of Postcolonial Asylum is geographically and disciplinarily extensive, taking an inter-disciplinary approach to British, EU and Australasian contexts. Farrier engages with asylum legislation, legal theory and ethics in readings of the work of asylum seeker and postcolonial authors and filmmakers, including J. M. Coetzee, Caryl Phillips, Abdulrazak Gurnah, Leila Aboulela, Stephen Frears, Pawel Pawlikowski and Michael Winterbottom. These readings are framed by the work of postcolonial theorists (Homi Bhabha, Gayatri Chakravorty Spivak, Paul Gilroy, Achille Mbembe), as well as other influential thinkers (Giorgio Agamben, Jacques Derrida, Jacques Ranciere, Emmanuel Levinas, Etienne Balibar, Zygmunt Bauman), in order to institute what Spivak calls a 'step beyond' postcolonial studies: one that carries with it the insights of the discipline as it looks to new ways for postcolonial studies to engage with the world. David Farrier is Lecturer in Modern and Contemporary English Literature at the University of Edinburgh.